One of the great new features of WYSIWYG Web Builder is Responsive Web Design. How can I design a responsive website with WYSIWYG Web Builder? A breakpoint is different 'view' of the same page with (mostly) the same objects, but with different positions and object sizes. Note: if you have a flexible layout using layout grids or flexbox then you usually only need 1 or 2 breakpoints. Can breakpoints be wider than the default view? Although it is possible to have breakpoints that are wider than the default view, it is generally not a good idea because it will make the default view obsolete. So, normally the default view is the widest view and all breakpoints are smaller! (**) Shapes, Text Art and Clip Art can be made flexible when used with Layout grids. Set the output format to 'SVG' and 'full width' to true. (***) If you apply effects (like shadows, effects, resample, filters, rotation, image frames) to an image/slideshow then it will no longer be responsive. UPDATE: In WYSIWYG Web Builder 11 many objects have responsive styles. For example text can have different fonts/sizes. Backgrounds can be different in breakpoints. The Photo gallery can have a different number of columns, etc. Which properties are responsive for each object is documented in the help. Text is also not responsive when you are using line spacing or symbols (via Insert Symbol), because in that case the height of text will fixed for one specific size. 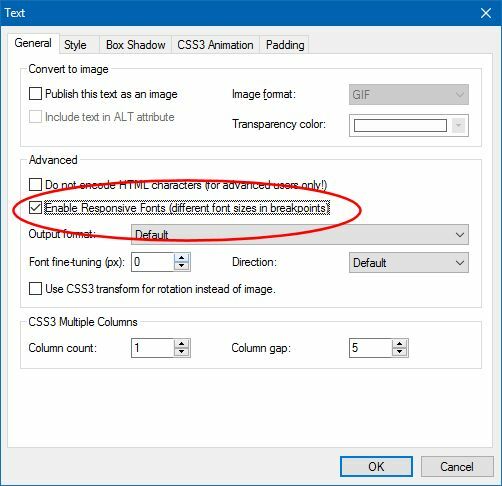 Note: in version 10.3 and newer you can use different fonts in different breakpoints: Use the option 'Enable Responsive Fonts' in the properties of the text object for this. This can be useful if you need a larger font for smaller screens. Each breakpoint can have a different text size. If this option is enabled, you can only use one font-family and font-size for the entire text object! Also the use of styles in combination with this option is not supported (because the responsive fonts will be applied to the text and that will overwrite global styles). However the Style Manager in version also supports breakpoints, so if you wish to use styles then do not enable responsive fonts, but use responsive styles instead. Yes, you can use the keyboard combination Shift+Ctrl+R to outline all non-responsive objects on the page. The outline color is currently fixed to red. UPDATE: WYSIWYG Web Builder 11 now supports layout grids. This is a great way to create responsive, full width and flexible layouts. And finally Web Builder also includes a dedicated environment for designing mobile websites. This is a very powerful environment, not only useful for mobile pages but also a great way to create flexible layouts. Note that the images are fully responsive and if you resize the browser window to 320 pixels then the images automatically get stacked horizontally! 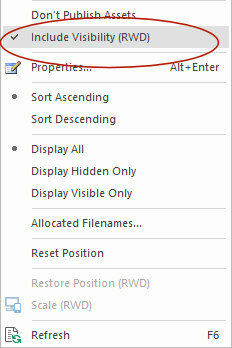 This option is also available in the context menu of the Object Manager. You can control the default value of this property in Tools->HTML->Use 'Include visibility' as default for new objects in Responsive Web Design. To control this behavior we have added a special option in Tools->Options->HTML->Keep inline styles with Responsive Web Design (use !important). If you enable this option then the software will not touch inline styles, but add !important to overwrite the position, size and visibility of objects with media queries. Tip: In WYSIWYG Web Builder 10.3.3 and newer you can make hidden objects visible with the option 'Render hidden objects', this makes it easier to troubleshoot layout problems. UPDATE: WYSIWYG Web Builder 12 now supports a new layout option to control the behavior of hidden objects. Tools->Options->HTML->CSS visibility property. This option controls the way objects are hidden. When using 'visibility:hidden' hidden objects will not be visible but they still affect the layout (just like in previous versions of WWB). On the other hand 'display:none' removes the object from the layout so it no longer affects the size of the page. This can be useful when hiding objects that are not inside the page boundaries in breakpoints. Note however that this may also change the behavior of event and third party code, so test thoroughly before using this option. My full width layer is not full width on all devices. A layer will stretch to 100% of the viewport, not the page width. The layer/header/footer will stretch to the initial size of the viewport. So if you rotate a devices then the layer may no longer be full width. Why is the undo stack cleared when switching between breakpoints? Undo is a 'snapshot' of the current state of the page. If you switch between breakpoints then the active view is changed but you stay on the same page. If you could undo actions that were done in another view then these actions would be applied to the current view and you would end up with 'scrambled page'. For example, all positions of the objects would be reset to the same positions of previous view. Help! Breakpoints do not work on my mobile devices. Some users make the mistake assuming that all mobile devices have a viewpoint of 320 pixels. However most modern phones have wider screen so the 320 breakpoint will never be displayed in that case.For example the viewport of an iPhone 6 is 375. So to optimize your layout (for example) for the iPhone 6 it should break at 375. But there are many different sizes. Note that you do not have to implement all those widths. To cover larger screen sizes it should be enough to implement 480. For example: when using master frames, first a breakpoint to the master frame, make one modification to begin with (move an object or change its size). This option can be useful if you want to create a copy of an object and hide the original object. For example, if an object is not responsive and it needs different properties in another breakpoint. Enable this option to outline objects that are not responsive. This may be helpful for Responsive Web Design, so you can either change the object's properties to make it responsive or use 'Clone and Hide' to create a new instance of the object. This option may be useful to trace layout problems caused by hidden objects. Note that hidden objects cannot be edited., so you will first have to unhide the object (with the Object Manager) to make changes. When you create a new breakpoint then sometimes it can be a lot of work to scale and reposition objects for smaller (or larger) viewports. The Scale tool may be useful for optimizing the layout in breakpoints. Basically it takes the size and position of the selected object(s) on the default view and scales it to the current breakpoint width. See the help for more details and known limitations. Hide the selected object in other breakpoints (but not in the current view) . 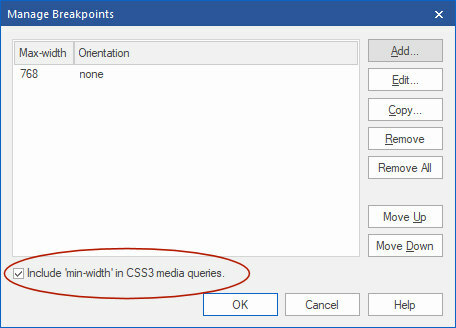 Unhide the selected object in all breakpoints (including the current view) . This option can be useful in breakpoints when you have ‘lost’ an object because it’s outside the viewport. ‘Reset Position’ moves the object to the upper left corner of its container. This option resets the size and position of the selected object so it is the same as in the Default viewport.